Whoever said “the best camera is the one you have with you” hit it straight on the mark. Recently I was in Iceland, enjoying its summer of eternal daylight and plethora of amazing waterfalls. I shy away from deeming myself a “nature photographer”. One either is extraordinarily lucky to be in great location with amazing light or they are persistent in order to be in that great location and finally have amazing light. I am not that patient and luck is fleeting. However, in Iceland there I was, on a tripod (ack!) photographing its abnormal number of incredible and accessible waterfalls. It felt as if every day I was at the bottom or top or side of yet another mind-blowing thundering cascade. At the first one, I used a neutral density filter for that languid slow shutter – de rigeurs for any water enthusiast. At the next I made panoramas. At another I played with multiple exposures (actually I really like what I did with the multiple exposures; it sure took Canon a long time to put that feature on the 5D camera!) and at yet another I even tried the new HDR feature on the Canon 5DMarkIII, even though I am not a fan of HDR. Finally I thought “Screw it, I’m just going to go look at the next waterfall!” But, grabbed my iPhone at the last minute. 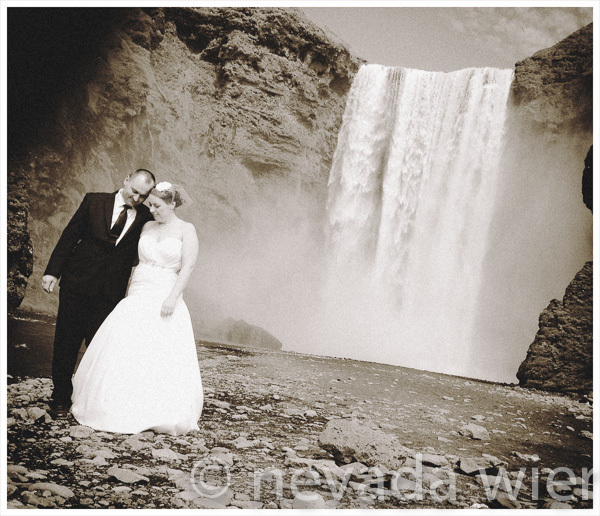 And, of course, at this particular waterfall I had the best photography opportunity of all because there was a wedding party of hardy Icelanders braving the cold spray for their photographers. People! My métier! Naturally I tagged along… with my iPhone. In my opinion, the iPhone is as “serious” of a camera as my SLRs. What type of camera one uses is irrelevant; it is how you use that matters. So there I was making the best waterfall image of the trip with my iPhone. After my initial frenzy of photo app buying and fiddling with photos in a ridiculously small screen, I decided that I only have the time and patience to use with two apps that does the processing for me. Since I don’t crop my images I found that Hipstatmatic (usually John S lens and Kodot film), or Camera Bag (I use Lolo, Italiano, and occasionally Magazine). that I liked best for my images. I have zero desire, or time, to spend messing about with other app processing. I already spend too much time in front of the computer editing my images and processing the RAW images I use in my assignments and personal projects. Two apps are plenty for me. During my travels I am usually carrying a Canon 5DMarkIII, with a retinue of lenses, for color images and a converted Infrared camera (I have a Canon 5DMarkII with a standard IR conversion and a Canon 5D with an enhanced IR conversion). And, I have the iPhone. That’s a lot of cameras to keep track of but I enjoy all the creative challenges. I’m heading off to China today to photograph the hill tribes in Guizhou. I have my arsenal of SLRs, lenses, flashes, accessories… and my iPhone! I bet I use it a lot, and not just because I left my other cameras behind. 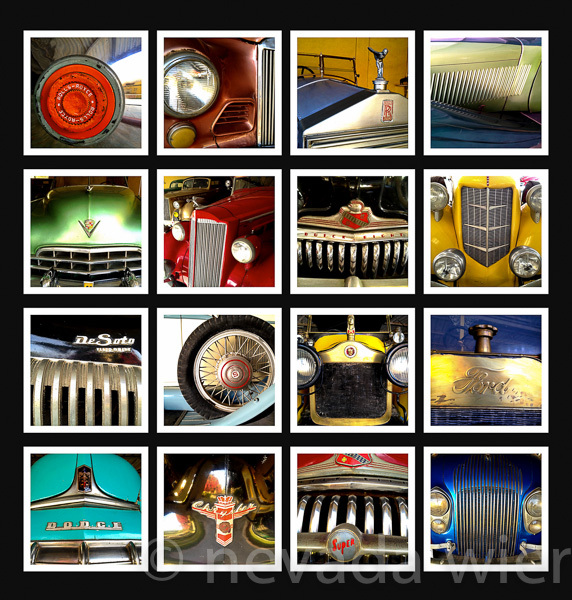 The following is another images I made this past spring in India at a vintage car museum in Gujarat. I used my iPhone4s to create a preconceived collage of images. I would like to post your photo of Myanmar on my blog (noncommercial in fact no viewers) . Would that be okay? Hi, Nevada — I got an iPhone 4S in April and haven’t explored its photo side much at all, so I appreciate the info here. To make the collage, did you use software that’s on the phone already, or was it in one of the two programs you mention? Sorry, I haven’t been able to reply sooner but I was traveling in China and WordPress is blocked there. I made the collage in the Adobe Lightroom 4 print module and exported it as a pdf. I completely agree. I just don’t see the need to carry a brick of a camera around if you are not going to make big prints or shoot low light without a flash. It was Jay Maisel who hit me over the head when he said, if you don’t have a camera of sometype you will never capture the best moments. I now carry a camera almost everywhere I am going including mtn biking, rock climbing, skiing, etal. I feel naked without a camera. I am looking foward to the new Canon M series when and if they add more controls. I love shooting with my iPhone too, have fun in China! Donde podemos ver tus fotos de iceland? Vincente: The location is listed under the photo. At Skogafoss Falls. Nevada, can’t agree with you more. I find that simply having the iphone in my pocket with a few photo apps helps me rethink what I shoot. I now look at a scene and wonder if I should use the contrasty B&W of a Hipstamatic combo, or maybe play with an HDR app. It has made some of my photography more fun! Hi Warren. Yep, it is just another way of pre-visualizing an image. I basically think that I am interpreting what is in front of me to suit the camera and lens, and now that sometimes includes the processing. Do you need anyone to carry your bags on your trip to China? I need all the help I can get but, trust me, you don’t really want to carry it!